Watership Down, many of us know about the original iconic 1987 film based on the book by Richard Adams, who unfortunately passed away in 2016. Its blood, Gory, and it's hand-drawn animations. 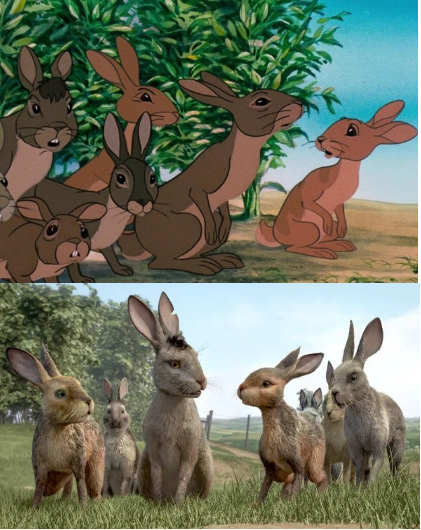 But this is 2018, so Watership Down has joined the list of film remakes as the BBC and Netflix have teamed up to bring the beloved story back to our screens. There will be one big difference to the original, it will be done using computer-generated imagery (CGI) rather than hand-drawn animation, so I suppose you could say that it's not a bad difference. If you are unfamiliar with Watership Down, it is about a group of rabbits fleeing from human violence and destruction of their home. The group are lead by a pair of brothers from their Warren, attacked by predators and go towards a promised land and a better society. So, you ask? Who are the voice actors? They include James McAvoy , John Boyega, Nicholas Hoult and Olivia Colman. Hazel and Fiver, the leading brothers, are voiced by X-Men’s James McAvoy and Nicholas Hoult. Bigwig is played by John Boyega. Gemma Arterton and Olivia Colman voice Clover and Strawberry. Other members of the cast include Ben Kingsley (from Iron Man 3) as General Woundwort, John Boyega (from Star Wars: Episode VII – The Force Awakens) as Bigwig and Gemma Arterton as Clover. This sounds interesting, When can I watch it? Watership Down will be airing on BBC one on Saturday 22 December (7 PM) and Sunday 23 December (7.20 PM). If you are interested in seeing the official trailer, Simply click HERE. Are you interested in watership down?